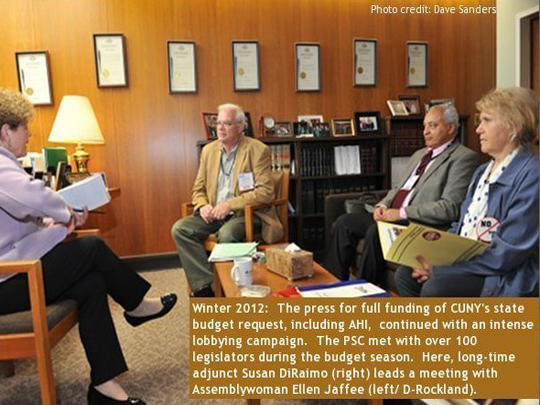 The PSC and CUNY sign the final agreement. The agreement provides regularized health insurance for an important part of the CUNY teaching workforce and contributes to stabilizing the finances of the PSC-CUNY Welfare Fund. 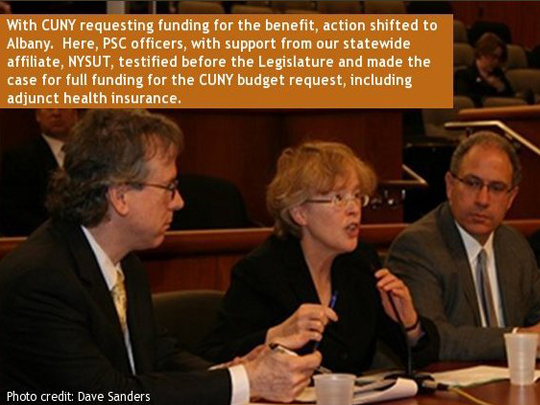 PSC has reached agreement with CUNY management to extend the current adjunct health insurance coverage through the PSC-CUNY Welfare Fund through September 30, 2014. Fourteen-Month Extension for Adjunct Health Insurance. 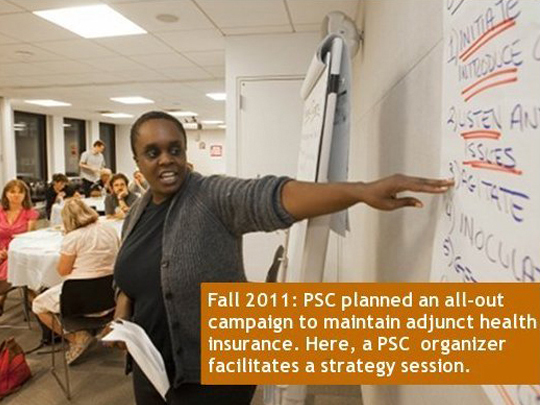 Adjunct health insurance through the PSC-CUNY Welfare Fund has been extended for a year and two months—through June 30, 2014. An agreement between the PSC and CUNY on the 14-month extension was reached today [4/24/13], and was supported by a vote by the Welfare Fund Board of Trustees. PSC’s State Budget Testimony for Fiscal Year 2013. PSC President Barbara Bowen delivered testimony about how the Governor's Executive Budget proposal will affect faculty, staff and students at CUNY. In her testimony, Bowen highlighted important positive developments in the Governor’s budget plan, like the inclusion of adjunct health insurance and funding for CUNY's mandatory cost increases, and she made a powerful case for more public investment in CUNY. Adjunct Health Insurance Extended Through Sept. 30, 2012. 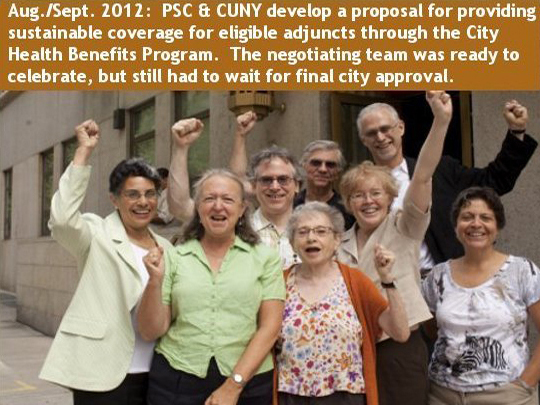 The PSC-CUNY Welfare Fund Trustees voted to extend basic health insurance coverage for eligible adjuncts while the final stages of negotiations on a new health insurance plan for adjuncts are completed. PSC Voices Rise at Trustees Hearing. The CUNY Board of Trustees held a hearing to collect public testimony on a number of items. At the hearing, testimony focused on three issues: adjunct health insurance, tuition hikes and revisions of the CUNY Bylaws that would undermine faculty and staff rights. 9/26/11 Rally for Adjunct Healthcare at Board of Trustees meeting. 500 PSC members protested inside and outside the September 26th Board of Trustees meeting which was held at the Baruch Vertical Campus. Click here to view a video. CUNY announces it will seek funding for adjunct healthcare. 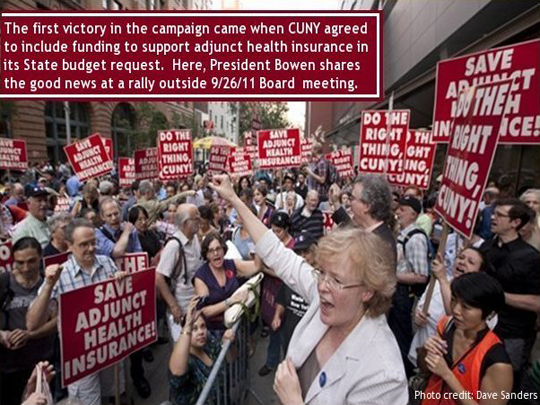 As hundreds of PSC members protested inside and outside Monday’s (9/26/11) Board of Trustees meeting, CUNY Chancellor Matthew Goldstein announced that the University will seek funding for adjunct health insurance in its upcoming State budget request. Views on the Crisis: PSC Members Speak Out. 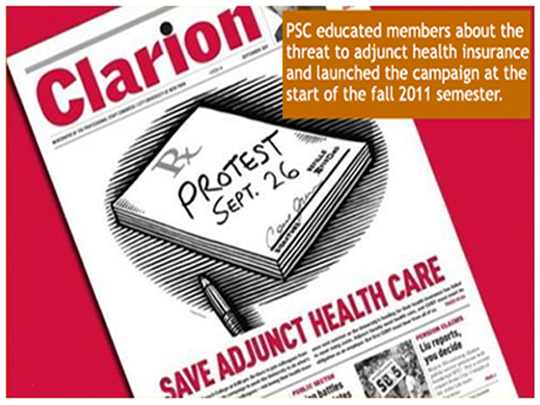 PSC members share their views about the adjunct health care crisis. A nightmare scenario has arrived at our doorstep. Seventeen hundred adjuncts (and more to come) could lose their health insurance come next September due to the rising costs of health insurance, the low contribution by CUNY, and the City’s failure so far to include CUNY adjuncts in the municipal health insurance plan. The Adjunct Health Care Crisis: A Welfare Fund Trustee’s Perspective. The trustees of the PSC-CUNY Welfare Fund reluctantly concluded that the financial structure for adjunct health insurance coverage had become unsustainable. At the July 25 Board meeting, the Welfare Fund Trustees passed a resolution to discontinue the current adjunct basic health insurance program as of August 31, 2012, unless sufficient and permanent funding or an alternative benefit source is secured. Adjunct Health Care: A Campaign We Can Win. 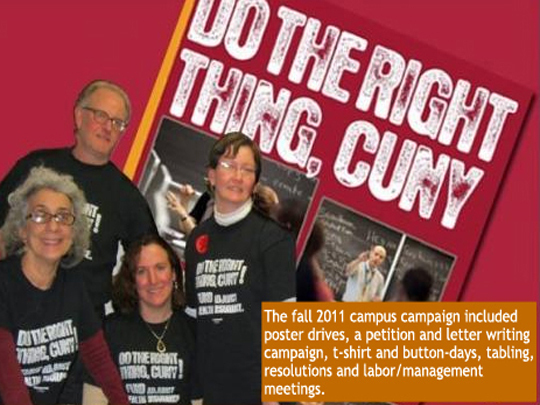 The union’s campaign to prevent the loss of health insurance for CUNY adjuncts. 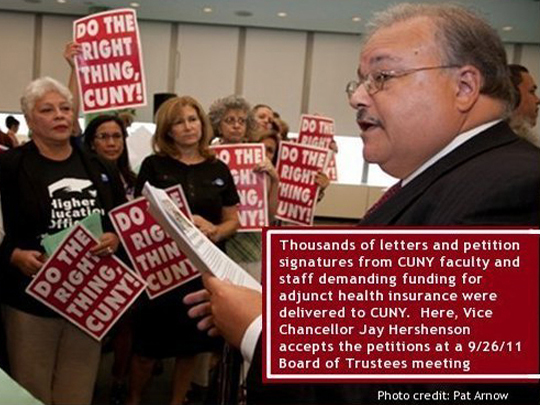 Response to CUNY from Steve London on Adjunct Health Insurance. 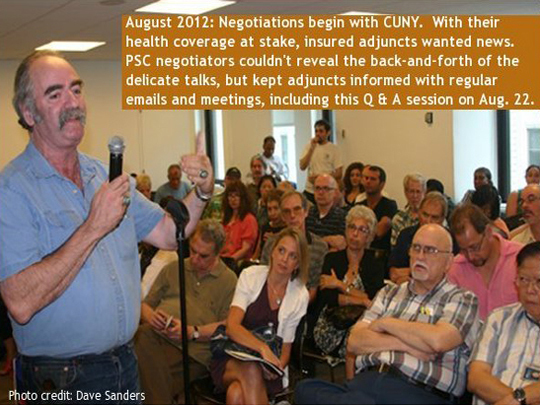 PSC first vice president responds to Vice Chancellor Silverblatt’s August 17th “CUNY Newswire” counter, and clarifies the history of the funding of adjunct health insurance through the PSC/CUNY Welfare Fund. Letter from Barbara Bowen to PSC membership. 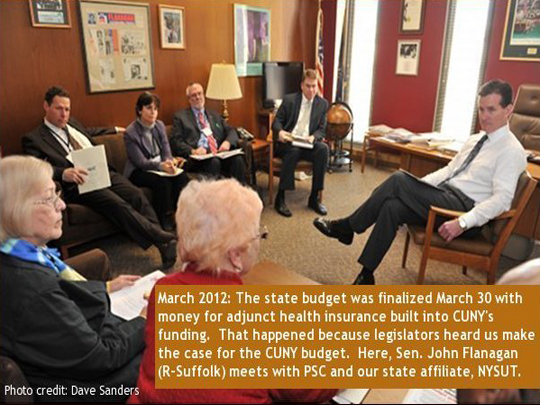 PSC president explains the current state of PSC adjunct health insurance. Frequently Asked Questions: Adjunct Health Insurance Campaign. What is the campaign for adjunct health insurance about? Letter from Barbara Bowen and Marcia Newfield to adjuncts. A letter from PSC president and PSC vice-president for part-timers of the PSC. Campaign to Save Adjunct Healthcare: Why Now? On July 25, 2011 the trustees of the Welfare Fund passed a resolution stating that unless sufficient funding or an alternative source of adjunct health insurance is made available by the end of August 2012, the current adjunct health insurance plan will be discontinued and a severely reduced benefit will be put in its place. The union is fighting back. After heightened union and student agitation, New York State agreed to offer the NYSHIP Student Employee Health Plan coverage to CUNY doctoral student employees under the same terms as SUNY graduate employees already enjoyed. As the deficit created by CUNY’s underfunding began to grow, the Fund treated it as a shared expense; the Welfare Fund negotiated reductions in the cost of adjunct health insurance itself, further reduced its already low administrative costs, and spread the cost among the 34,000 participants eligible for Welfare Fund benefits. The Fund was also able to draw on increased contributions negotiated for all City welfare funds by the Municipal Labor Committee, on increases negotiated by the PSC with CUNY in 2004 and 2006, and on a $30-million reserve negotiated by the PSC and CUNY in 2006. But the shortfall in CUNY’s funding for adjunct health insurance kept growing. It became so large that no amount of efficiency or benefit-cutting would solve the problem. 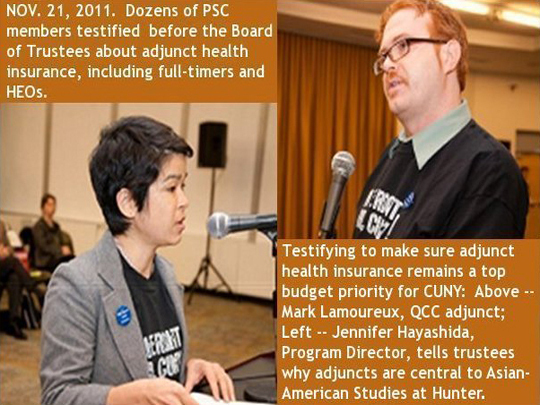 The PSC won a $1.5 million increase in CUNY's flat rate of annual funding for adjunct health insurance in 2002, but since then CUNY’s funding for adjunct health insurance has remained unchanged—despite huge increases in both the number of eligible adjuncts and the cost of insurance. In every round of contract negotiations since the present leadership took office, the PSC has demanded that eligible adjuncts receive health insurance from the same source as full-timers. for 12 years, CUNY steadfastly refused our demand. Eligibility criteria, the right to receive adjunct health insurance for those who meet the criteria, and CUNY’s flat rate of funding for adjunct health insurance to the Welfare Fund were established in 1986 through collective bargaining and are covered in Article 26.6 of the contract. Unfortunately, as CUNY expanded its reliance on adjuncts and healthcare costs increased, CUNY's flat rate of funding covered less and less of the cost of adjuncts’ health insurance.